Just because the kids are back in school doesn’t mean the fun times have to end. Bring the whole family together in the kitchen with something everyone will enjoy. 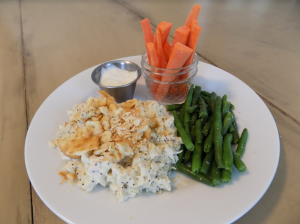 Check out these three tasty recipes that Brandi Lindsey, owner and cook of WIldberry Café and Catering, loves to make (and eat) with her children. Looking for an easy-to-make snack you can share with the whole family? 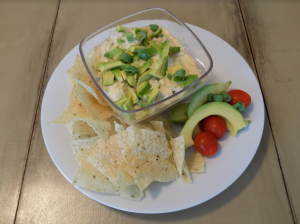 Combine favorites like chicken and cheese to create a dip to enjoy after school. This is a great way to sneak in some avocado and beans for those picky eaters, as well. Mix all ingredients together except the avocado and chips. Place in a bowl for serving, and gently mix in the avocado. Serve the dip alongside the chips. Brandi’s girls also love this mixture rolled into a tortilla! Brandi’s niece, Sadie, loves this easy-to-make dinner. Every time she comes for a visit or they all go on vacation at the beach, they make her favorite, what she calls, “chicken with black stuff” (the black stuff is the poppy seeds). Brandi’s girls also love to have this. It is a very easy meal to do after school and one the kids can help with too. They usually serve it with some green beans and carrots with ranch. What kid doesn’t love that? Place chicken in a stockpot and season with salt, pepper and Italian seasoning. Bring it to a boil until no longer pink (this will take about 20 minutes). Remove chicken from pot and let cool slightly and then cut chicken into medium-sized cubes. Mix the chicken with the sour cream, cream of chicken and seasonings until well combined and creamy. Add the poppy seeds. Preheat the oven to 350 and place the chicken mixture into a casserole dish. Mix the crackers and butter together and top the casserole with it, and bake for about 30 to 40 minutes until bubbly. Serve on top of white rice and enjoy! Looking for a sweet treat that’s as fun to make as it is to eat? Line a loaf pan with plastic wrap. Cut the pound cake into three pieces horizontally. 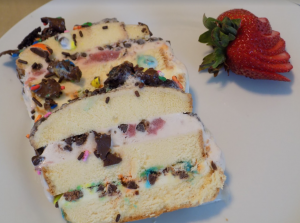 Put the first slice of cake into the loaf pan and then cover it with one of the ice cream flavors. Place some of the mini chocolate chips on top of the ice cream. Add another layer of cake and then cover with the second flavor of ice cream. Top this layer with the M&M’S. Place the final layer of cake on top of the ice cream, and top with the third ice cream choice. Top this layer with your Magic Shell and then the extra candies and sprinkles. Fold over the plastic wrap once the sauce has set, and put it in the freezer for four hours until frozen, Brandi’s girls can never wait that long! When you are ready to eat, unmold it from the plastic wrap, and slice it for serving.